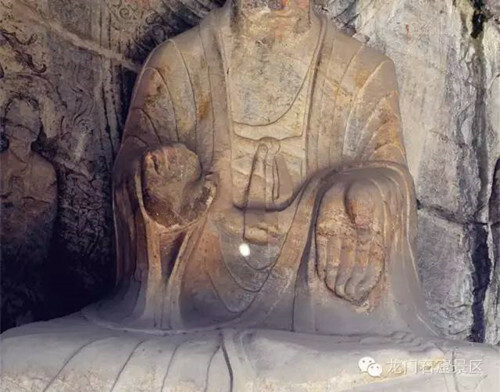 The Sakyamuni statue in Huangfugong Cave, Longmen Grottoes with a height of 3.18 meters, was built in a sitting position above a square lotus seat. He stretches out his right arm forward, palm facing out; left palm also facing out but fingers down. What's interesting about this statue is that the Buddha's left hand was engraved with six fingers. Is this the negligence of the craftsmen? It's apparently not. The cave was opened under the supervision of a senior official from the Northern Wei Dynasty ( AD 386-534). The six-finger Buddha can't be a bad mistake among the overall elegant carvings. So what would be the special meaning behind it? 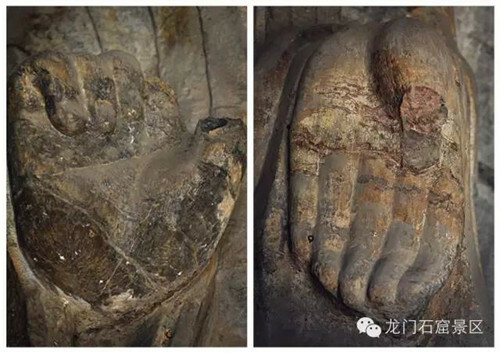 Historical records show that the Wencheng Emperor (the fifth emperor in Northern Wei) once ordered officials to carve a Buddha statue based on the image of the Emperor himself. Another saying goes like this: the patron of the cave, Huangfu Du is the maternal uncle of the Empress Dowager Hu. He opened the cave to ingratiate himself with the empress dowager and Xiaoming Emperor (the 10th emperor in Northern Wei). Thus it is speculated that the Buddha statue was the imitation of Xiaoming's father, who might happen to have six fingers on his left hand. Some legends also go that Buddha came from a more enlightening place of the universe to show us the way to attain the light body.